I know Cherry Mobile. My brother used to have one when I visited the Philippines 4 years ago. It is a local brand in the Philippines sold at the market at an affordable price. But I honestly haven’t heard of ZTE Mobile until today. I did a little digging and found that it is actually an international telecommunication company from China. 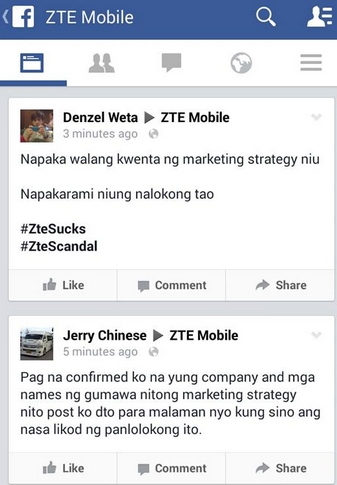 ZTE Mobile came to my attention when my former colleague at a contact center in Makati, posted screenshots of disappointed buyers airing their views about the company on Facebook. I tried to search for similar stories to fully understand what really transpired. 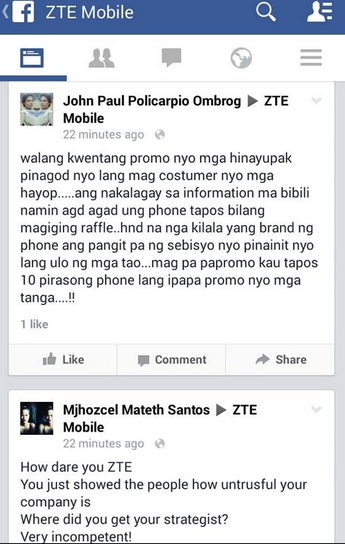 It is believed that ZTE Mobile announced on their FB page yesterday that they were selling a unit originally worth P12,000 to just P1,999. And since it was like a give away in a sense, people scheduled a trip to malls and other ZTE outlets nationwide. One user lamented that she waited for six hours but got nothing even a single unit when she left. Contrary to their advertisement, the sufficient stocks they promised weren’t that sufficient. At SM Southmall where my colleague went, people were standing in long queues and patiently waited for hours. For the love of “phone,” ZTE Mobile has only 15 units in their possession. The company was met with negative comments from disappointed buyers – with the marketing strategists being singled out as unprofessional, incompetent and deceitful. One user even promised that once he confirmed those behind it, he will post their names on his social media account. 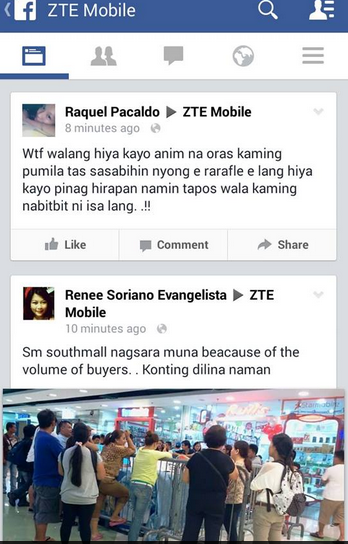 Note: My colleague informed me that comments on ZTE Philippines Facebook page has now been disabled.